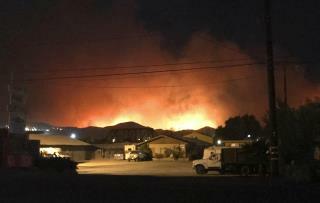 (Newser) – Ferocious winds in Southern California whipped up an explosive wildfire that forced thousands of homes to evacuate and could soon threaten a city of more than 100,000, authorities say. The blaze broke out Monday and grew wildly to more than 15 square miles in the hours that followed, consuming vegetation that hasn't burned in decades, Ventura County Fire Sgt. Eric Buschow says. The winds are pushing it toward Santa Paula, a city of some 30,000 people about 60 miles northwest of Los Angeles, the AP reports. Most of the evacuated homes are in that city. Authorities say that the city of Ventura, which is 12 miles southwest and has 106,000 residents, is likely to feel the effects soon. "The fire growth is just absolutely exponential," Ventura County Fire Chief Mark Lorenzen says. "All that firefighters can do when we have winds like this is get out ahead, evacuate people, and protect structures." One person was killed in a fire-related car crash and at least two structures have burned so far, officials say. Winds exceeding 40mph and gusts over 60mph are expected to continue, the National Weather Service says. Firefighters and aircraft from neighboring Los Angeles and Santa Barbara counties poured in to help, though darkness and winds forced the grounding of planes late Monday night. The Los Angeles Times reports that 260,000 people in the area were without power early Tuesday. I'm just waiting for the senile pulpit-thumping of a Jerry Falwell et al, "This is God's punishment,,,,," Should we anticipate a slew of tornadoes to soon hit Alabama, should Roy Moore's perverse acolytes succeed in 'erecting his monument' to pedophilia? Face it, nary a region of the nation has been spared an overdose of some sort of disaster in recent years, and I give much greater credence to the climate scientists, than to "End of Days" proselytizers, although North Korea v. Donald J. Trump does suggest those crazies have a dog in that fight. That is heartbreaking to see the fires destroy peoples lives. Hopefully everyone gets out safely. For the rain we had this last year, our fire season down south has actually been pretty mild.